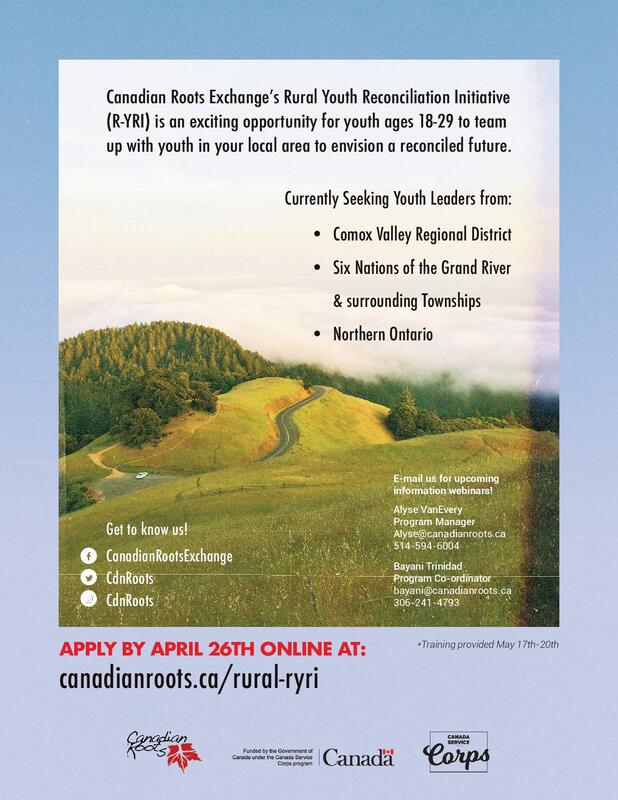 The Rural Youth Reconciliation Initiative (R-YRI) engages rural young leaders aged 18 to 29 years from across the country, building a national network of young leaders realizing their own transformative visions of community building. Rural teams of Indigenous and non-Indigenous youth leaders work together over three months to plan and implement a community project within their respective communities. Youth leaders are required to attend a training (all expenses paid) at the beginning of their mandate. The community action project is developed as a team, requiring approximately 6-10 hours of volunteer work per week. Before applying, please read through the project description and eligibility requirements in the Rural Youth Reconciliation Initiative callout. Applications can be submitted through this online form. The deadline to apply is April 26th at midnight EST. Want to find out more about the current R-YRI teams? Click here to find out about the Kamloops & Northern BC youth leaders, Lloydminster youth leaders, and Kangirsuk youth leaders. If you have any questions, feel free to contact Alyse at alyse@canadianroots.ca or Bayani at bayani@canadianroots.ca. Learn more about the Canada Service Corps!